BIAFRA: OPEN LETTER TO MAZI NNAMDI KANU: "SPEAK TO BIAFRANS IF YOU REALLY ESCAPED THE MURDEROUS INVASION OF THE NIGERIAN ARMY"
I am obliged to use this medium, due to the growing concerns your teaming millions of followers all over the world have concerning your whereabouts and well-being, to fully express my concern. Your irresistible and reverberating voice of courage has suddenly disappeared and your followers are left in the battlefield without your physical input. It could be recalled that the Nigerian army under the tyrannical grip of Muhammadu Buhari, was ordered to murderously invade your residence and have you eliminated on the 14th of September 2017 which has variously been evidenced before the global community. You vowed to abide by the just laws of Nigeria even if the court is situated in Sambisa forest. You never jumped the bail you were granted, even at the detriment of your life as diverse provocation of the Nigerian security agencies lasted. The government of Nigeria in connivance with it's British slave masters, plotted the callous invasion of your residence through the instrumentality of their terror outfit (the Nigerian army), actually carried out their plan of having you summarily executed. Up till date, your whereabouts could not be ascertained and whether you are yet dead or alive, nobody can tell. Going by the deluge of catastrophic visitation that greeted your serene and beautiful residence which eventually turned to an arena of death and destruction, it will remain historic to humanity if you actually escaped that horrific invasion that left a pet dog and quite a number of dead and maimed promising Biafran men and women on the trail. From my personal research, I can state here that Biafra land was infiltrated by saboteurs who made your safety unguaranteed. Your speeches, before you got missing were clearly and categorically delivered, and had never breached legal requirements. Therefore, it is commendable for your legal counsel, Barrister Ifeanyi Ejiofor to unambiguously place a demand before the court, that the Nigerian army be compelled to provide you dead or alive. Very disappointedly however, the grossly compromised Nigerian Judiciary is acting according to the script handed over to it, by the despotic government led by Muhammadu Buhari. Justice Binta Nyako, the presiding judge and Buhari's kinswoman, has shamelessly remained inconsistent with the requirements of an unbiased legal profession in her decisions. Instead of maintaining firmness and fairness, she allowed the leadership of the Nigerian army to concoct lies and conceal it's atrocious manipulations, just to beguile the gullible. 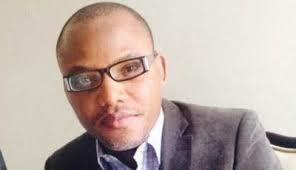 Biafrans are deeply worried about you, my courageous and ebullient leader over your silence these past months. Your cause is exceptionally genuine and in tune with civilised laws all over the world. The informed and concerned International community is asking questions about your whereabouts. Your beloved Biafran brothers and sisters, the world over on whose total and complete emancipation agenda you uncompromisingly embarked on this project, are anxiously awaiting to hear you speak once again to them as their leader. It has now dawned on the United Nations to prove to mankind, if their established laws of freedom for the oppressed indigenous people groups, is a fraud promulgated essentially against the interest of the blacks. 1) Gather all known Nigerian intellectuals for a possible debate on why Nigeria should continue to exist as an entity, under the coordination of International observers and if they win, you told them that you will automatically hands off the struggle. 2) that if the man presently in Aso Rock is Muhammadu Buhari which stood for election in 2015, is still the same, after a DNA test, you will quit the struggle. 3) Conduct a transparent and acceptable referendum for Biafrans to decide their future within the Nigerian contraption, whose overwhelming decision will form the basis of existence. But as it has clearly become a herculean task for the Nigerian government to boldly step out to counter the above challenges posited before it, it then confirms most assuredly, that you are fighting a just and commendable course. It is based on their inability to manage their shame of decades of lies, deception and wickedness, they seemingly resorted to the only available option left to them in their own thinking, by hatching a murderous plot to permanently eliminate you and IPOB family members by all means. May the souls of our fallen heroes and heroines continue to haunt and hound our enemies! May ChukwuOkike Abiama continue to guide, protect and lead you on the right track. Iseeeeeeeeee! !